Excellent or good air quality has been reported in 233 days out of the 334 days in the first 10 months of this year. Furthermore, lower density of the hazardous to health PM2.5 pollutant particles and improved water quality has been reported this year thanks to strengthened environment protection law enforcement, said a city government report. According to the report, which was issued on Thursday, the average density of PM2.5 particles – Shanghai’s major air pollutant – was 37 micrograms per cubic meter in the first 10 months of 2017, a 14 percent decrease compared to the same period last year. The year-end average figure is likely to see a rise, as winter is the season when air pollution occurs most frequently. Excellent or good air quality (with the Air Quality Index no higher than 100) in the first 10 months averaged 76.6 percent, a 0.2 percent increase compared to last year. Water samples collected until September from the city’s major rivers were tested to be meeting the water quality standards, a 16.6 percent rise on the same period last year. However, 22.8 percent of the samples still failed to meet the lowest National V standard (not even suitable for agriculture or landscape use), a 15 percent decrease on last year. 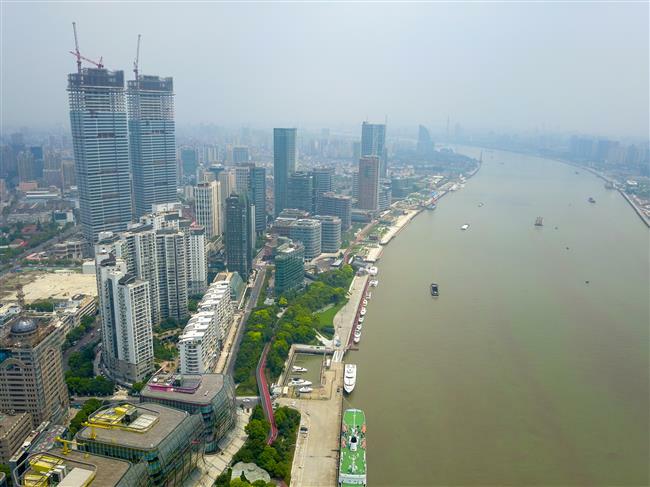 Shanghai applied the country’s “river chief” scheme this year, whereby leading officials take responsibility for addressing water pollution, including waterline management and pollution control. A total of 7,781 river chiefs have been named for all the rivers, lakes and small waterways around the city. According to the environment protection authority’s plan, all black and odorous rivers around the city will be cleaned before the end of the year. After receiving a feedback report by the central government’s environment inspection team in April, Shanghai government made specific renovation plans to rectify the problems the report pointed out. According to the city government’s report, 36 renovation projects had been accomplished by October including anti-pollution measures against dangerous chemical product storage companies, heavy metal enterprises, as well as floating cranes at the upstream of Huangpu River. Other projects involving sewage, garbage and sludge are also being carried out according to the schedule, said the report. Strengthened law enforcement also contributed to the environment improvement. According to Shanghai Environmental Protection Bureau, 3,967 environment law violations have been dealt with in the first 10 months, up 62 percent on the same period last year. A total of 395 million yuan (US$59.8 million) fines has been issued, up 130 percent. Illegal discharge of volatile organic compounds (VOCs) into the city’s water reservoirs and rivers, as well as illegal transporting of garbage, were among the major law enforcement targets this year. Renovations against VOC discharge have been taken in 478 enterprises involving shipbuilding and other industries. Over 4,000 automobile maintenance and repair companies and, as well as over 7,000 restaurants with cooking oil odors and smoke pollution problems, being ordered to take renovation measures. According to the environment bureau, Shanghai is making its seventh three-year environment protection plan, which will set environment improvement goals for the 2018-2020 period.